If fishing for you is more about pulling the most catches out of a lake—instead of simply using your wits to outsmart nature—then the more gear the better. 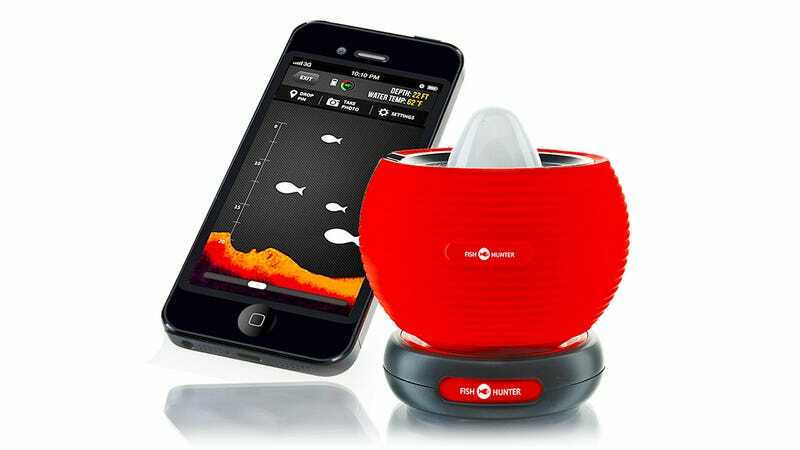 And while fish finders have been around for decades, the FishHunter is the first to turn your smartphone into a window to what lies below the water's surface. Instead of having to strap the sonar hardware to the side of a boat or a dock, the FishHunter is small enough to float on the water's surface, letting you simply tether it with fishing line so it doesn't drift out of range of your smartphone's Bluetooth connection—about 80 feet or so. On a full charge the FishHunter will scan the murky depths to up to 120 feet below the water's surface for somewhere around six to nine hours. And it reports back what it finds—from the topography of the bottom of a lake, to what it thinks are fish—to your iPhone or Android smartphone's display.